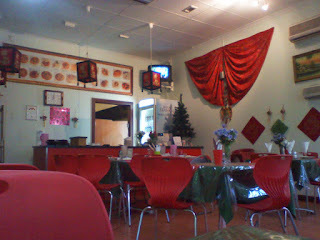 When we first arrived in the area Madhumoti was our regular haunt for curry. It's a cheery but basic place, hovering on the border between cafe and restaurant. The decoration is basic and cheery! 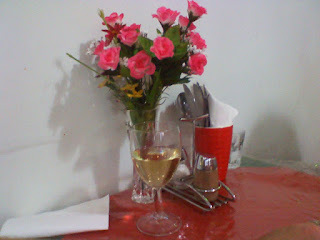 It's byo too, and you even get your own flowers. Recently we've visited the nearby Taj Palace and Aangan more often, but still had good memories of decent meals here. Last weekend after some wandering we ended up back at Madhumoti. We ordered a lamb Vindaloo, an eggplant dish and a lentil and chickpea dahl, with rice and naan. The dishes arrived pretty promptly, and we dug in. 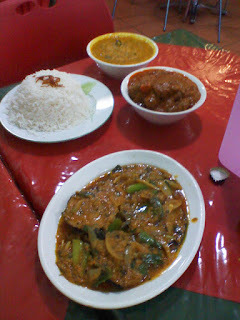 Immediately we noticed that the curry and the eggplant dish were pretty oily, as you can see from the picture. Unfortunately the amount of oil spoiled the two dishes although they were both nicely spiced and well flavoured. The dahl was the winner from the meal, and was slightly thicker than some and the chickpeas added nicely to the texture. I'm not sure we'll be heading back too soon, as there are some other good local options, it's a shame as we'd had some better meal here before.